Max was on travel earlier this month, and while he's away, I skip out on cooking. Tell me I'm not the only wife who does this?! Usually I'm all about sit-down weeknight meals, but if Max is gone, Parker and I are happy with snacking (I've even been known to make whole meals out of ice cream and popcorn, though I at least try to get in some kind of veggie for Parker). Sometimes I need a real meal though! 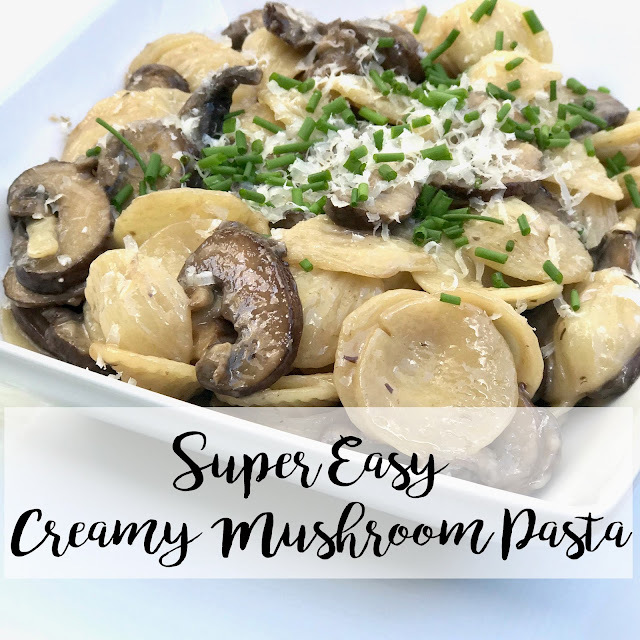 Enter this super easy creamy mushroom pasta - no measuring, very few dishes, and really no actual recipe! It's a perfect bowl of happiness on a chilly day or night. The secret ingredient? Parmigiano Reggiano! Grating the real thing yourself makes all the difference! Ready for the (non) recipe? Adjust as needed for how many you're feeding and if you want leftovers! One of my favorite things about this pasta is that I can make a single serving just for me! Cook the Orecchiette in salted water. While it's cooking, brown a chunk of butter in a skillet (I love butter almost as much as The Pioneer Woman does, so I use a ton). Add lots of sliced mushrooms to the butter (just a handful if you're making a single serving). Stir in a bit of cream, then add the cooked pasta and as much Parmigiano Reggiano as you can grate. Top with more Parmigiano Reggiano and also a bit of herbs for a pop of color (we still have chives in the garden so I used those). Enjoy! I mean, seriously, are you just dying to dig into this bowl of heaven?? 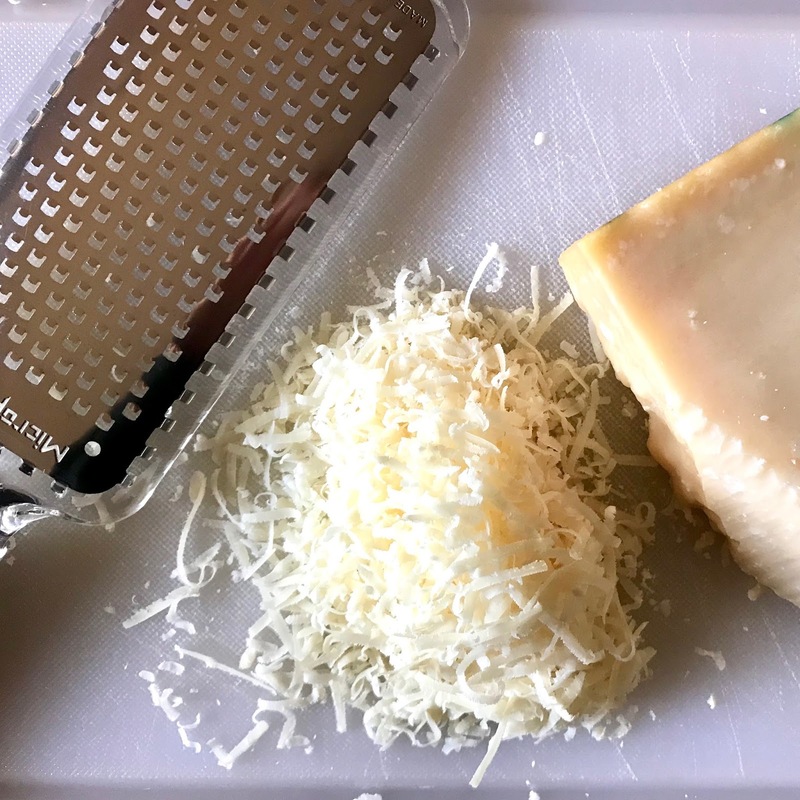 Thank you to parmesan.com for supplying the Parmigianno Reggiano for this recipe! This looks so good. I just showed my fiancé because he loves pasta and he said 'please make it' ha! I'm so a pasta lover, too! Such a tasty dish. I love that you can make the serving as big or little as you need. Yes! I think about serving sizes all the time now after you posted about eating things you love, just smaller portions. This looks SO good!! I will definitely give it a try! 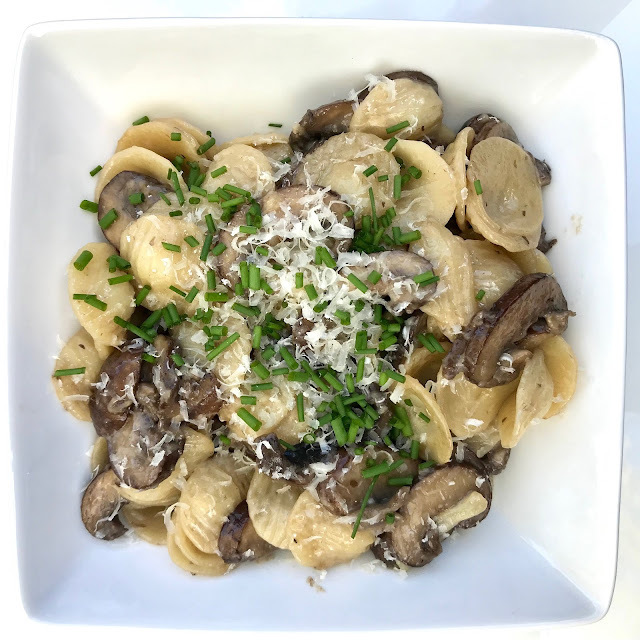 My husband doesn't like mushrooms, so I love that you can make a single serving! I will have to give it a try next time he's out of town, haha! Thanks! It's a perfect "on your own" meal!